1. I have been accused of bigotry against Ohio State fans. Sure, I refused to date a Buckeye, just because she showed he…r “scarlet letter”. That doesn’t mean anything. I have a Buckeye friend. Seriously, I do. 2. That we have been conned into buying hand lotion and body lotion and face lotion is the biggest retail scam of all time. Yes, I do still buy all three. So?? 3. If the weather is cold outside people tend to turn the heat up above what is considered “room temperature”. If the weather is hot outside, people tend to turn the AC temp down below “room temperature”. Why can’t a thermostat be set to the one optimal comfort temperature and everyone be absolutely ecstatic with it? 4. In movies, people do the strangest things: they have obvious breath moments (like waking up from being unconscious or rescued from a long time being lost) and they still get the deep kiss, without hesitation or a grimace. Morning breath is enough to turn me off…or her over. 😉 Intimidater! 5. Also, people in the movies never plug their phones in. They wake up in the morning and just grab it and go. Sure…TV people…sure. 6. Although, admittedly, my phone gets the best battery life. It can last for days. The secret tweak is to never use it or even touch it. 7. I am a firm believer that money can definitely NOT buy happiness…with a caveat. Money DOES create an environment conducive to the nurturing of happiness, so I’d rather make that journey loaded up with cash. 8. Honesty is the best policy…unless you’re dealing with dishonorable arse holes, in the real world. 9. Why is emotional cheating a thing? Isn’t that called having friends??? 10. We say that things are worth dying for, but if you do, you’ll never know. So you’ve got a presence on Facebook, Twitter, LinkedIn and maybe even Pinterest and InstaGram. You post and you “Like”. You “Follow” and ReTweet and you probably even add some #hashtags, from time to time. I’m the one who has to tell you that you’re not doing any of this, the right way. 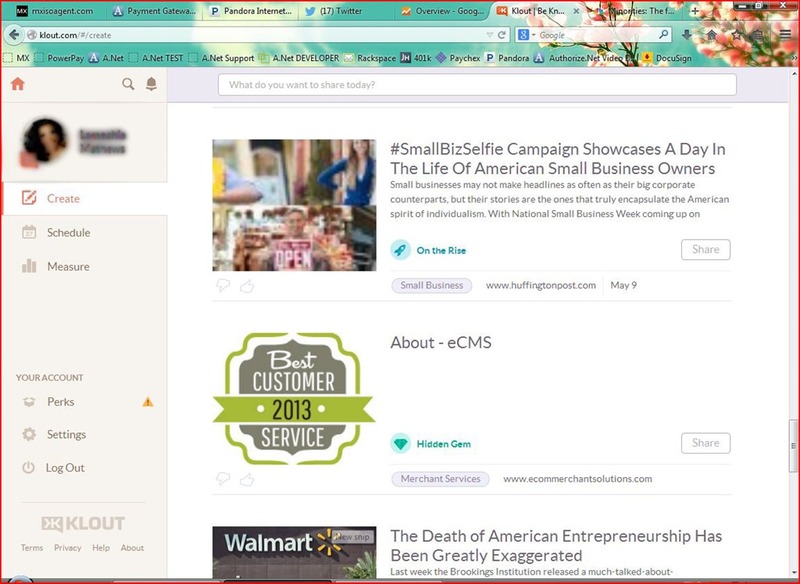 Social Media client, eCMS, gets Klout! If you’ve been keeping track of me these past few months, you know that I’ve been going to Portland, Oregon from time to time. Sure it’s been a lot of fun, but I’ve been going there to work with eComMerchantSolutions. It appears that the social media work that we have been doing is starting to work.